Several members were doing the Berlin Tour and so were absent for the Grand Theater run. The ken-1 members all participated in the Grand Theater run. The reign of Ramses II, praised as the Pharaoh of Pharaohs, was far in the past, and ancient Egypt approximately 3000 years ago lay in the hands of the high priest Nebuheru and his cohorts of the Amen Temple. Nebuheru abused the government's money and power at the expense of the people of Egypt. Enenpses III, the Pharaoh who triumphantly commanded the Amori-Araza War, returns to Egypt proudly displaying his golden military dress. A fight-to-the-death battle tournament follows in the colosseum to celebrate the Egyptian victory and the glory of the Pharaoh. A violent battle erupts between swordsmen struggling for their lives. Soon only Sety and his sole friend Naktom remain standing. Sety corners Naktom, but cannot bring himself to kill his only friend. Suddenly, the voice of the merchant Kenamen echoes in the colosseum: "Kill him!" Naktom charges and Sety raises his sword in defense, fatally piercing his friend. Sety's false victory wins him freedom and a bag of gold at the cost of a heart devastated with unbearable grief from the loss of his friend. Sety is later found drowning himself in alcohol at a city bar as if to punish himself for his ill deed. The priest Ahames begins to talk to him. Ahames has come to take Sety to the Amen Temple. The high priest Nebuheru has called for Sety, who happens to be the splitting image of the Pharaoh, to act as the Pharaoh's stand-in for an upcoming trip. Sety consents, and succeeds in playing the part of the Pharaoh. Shortly afterwards, news comes in that the real Pharaoh has fallen ill. In order to hide Egypt's current ruling weakness from neighboring countries, Nebuheru decides to retain Sety as the Pharaoh's substitute. Seitahat, a mercenary, is hired to work as Sety's bodyguard. One day, a magnificent banquet is held in the Amen Temple, with King Taharuka of Nubia as the main guest of honor. At this party, Taharuka takes a liking to Erudia, the lady in waiting to Queen Neferuty (the real Pharaoh's wife), and attempts to forcibly take her back with him. But Sety, without asking for the Empress Dowager Merieto's opinion, saves Erudia according to the Queen's wishes. The next day, Sety and the Queen receive messengers from Araza. The three messengers attack Sety by surprise. They have come to protest for the Egyptian people who are suffering from heavy taxes and to bring to light the corruption and tyranny of government officials. Sety's bodyguard Seitahat kills two of the men, and as the final one attempts to attack the Queen, Sety skillfully brings him down without killing him. Witnessing Sety's skill with the sword, Seitahat realizes then that Sety cannot be the real Pharaoh. Queen Neferuty also realizes that this Pharaoh is an imposter, but she finds herself gradually becoming attracted to Sety, whose kindness and strength have saved both Erudia and herself. Sety believes that it is time that Queen Neferuty finally realizes the injustice her people have suffered. And so Sety and Neferuty venture out to the city accompanied by Seitahat and Erudia. Neferuty sees the real situation of her people's lives, and realizes that the high priest Nebuheru and his men serve not the Pharaoh but their own greed and avarice. One evening in the palace, Sety and Neferuty gaze at the blue star of Isis glittering in the sky and talk for a long time. They have gradually come to love each other, despite their differing social positions. Eyes of a cat glimmer, hunting for prey. Two Black Cats sing "Miracat is mine." A young nobleman dances, longing for Miracat. Miracat appears. Just as the nobleman and Black Cats try to touch her hand, thunder crashes. The black screen vanishes ans a beautiful castle becomes visible. King Miracat appears under the bright moonlight, and he falls desparately in love with Miracat under the burning moonlight. A joyous banquet is held under the starlit night. Black Cat appears and begins to beat a rhythm. Black cats wearing derby hats enter one by one, and join in. The black cats rejoice, having dominated the rhythm. A 1930s jazz club owned by King, a legendary jazzman. King enthralls the women with the blues, making them dance. He makes Black Cat dance with Shanghai Lily. Manipulated by King, they dance crazily together. When King stops the rhythm, everything stands still. An argument erupts between King and Black Cat, who attempts to create a rhythm. Lovers cats sing about "love." An angry "Shh!" is heard and suddenly a stone comes flying, shattering the stained glass window. A hymn is being sung by all. A bridal procession passes by. The floral decorations suggest spring in an Italian city. When the stained glass shatters, the bride standing in the center, the grand duke, and priest begin to dance a dance of forbidden love. The grand duke sings a song of hopeless love. Gypsy cave glowing warmly in the dark appear. Gypsies (Wild Cats) travelling ni search of freedom dance in the dry desert, thirsting for what they do not have. The Wild Cats happen upon beasts from a beautiful country. The season of love begins. Mira King appears in a temple. A carnival of cats gradually shifts into a joyous parade. The scene is a run-down inner city area of New York City. A broken stoplight flashes. Stray cats appear from behind garbage bins and fire hydrants. The crash of an iron-barred door slamming shut sounds. A jungle of black birdcages can be seen. Wounded soldiers (stray cats) are slumped inside the cages. A desparate dance to escape from the cages begins. A white cat appears. Although the cage bars her love, it disappears once her hand touches the trapped soldier's. He is freed under the starlit night. A bright number performed by Miracats. Black cats perform a precision dance. Lovers dance. A duet dance. Finale. 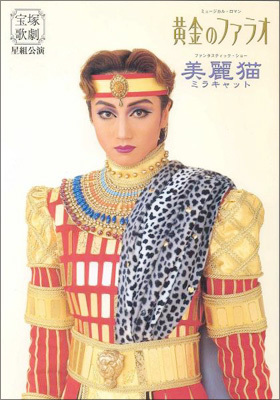 Tsukasa Yuuki retired on Aug. 3rd, after the Takarazuka performances. Otowa Ryou, Azusa Marin, Ayase Saki, Miya Erika, and Hisato Rie retired on the day of the final Tokyo performance. Shouno Saki retired October 3rd, between performances following the Tokyo run. Natsukaze Rio retired November 12th, after the national tour. Mizuno Chiharu and Mifune Seika retired November 20th, between performances following the tour. Members of the 86th class also appeared in the Takarazuka run of Miracats. Created by caithion. Last Modification: Friday 03 of July, 2015 15:20:45 PDT by caithion.